In sixth decad – For those who wonder “Is there any way for the most lowly person with very inferior tools to approach emperumAn who is avAptha samasthakAman (one who has all desires fulfilled), nirapEksha (one who has no expectations), paripUrNa (fully complete)?”, AzhwAr explains that though emperumAn is fully complete, him being very simple due to his sriya:pathithvam (being the husband of srI mahAlakshmi) and those who worship does not have the ability to fully satisfy emperumAn and emperumAn too does not have any specific need that will be fulfilled by such offerings, as explained by bhagavAn himself in the middle portion of bhagavath gIthA, approaching him is very easy to do. In the first padhigam, AzhwAr enjoyed emperumAn being sarvasmAthparan (superior to everyone else). In the second padhigam, he asked everyone to worship such supreme lord. Subsequently (in the third padhigam), his easy approachability which is required for worshiping him is explained. Subsequently (in fourth padhigam), AzhwAr explained his aparAdha sahathvam (tolerating mistakes) which is the cause for his easy approachability. Subsequently (in fifth padhigam), his simplicity and easy-going nature are explained. When asked “what is the use of all of these if he is very difficult to worship?”, AzhwAr says that he is svArAdhan (very easy to worship). In the previous padhigam, AzhwAr said “I am unqualified” and emperumAn convinced AzhwAr to be with him and then thinks that AzhwAr was accepted by him for some purpose, but since then nothing has happened. 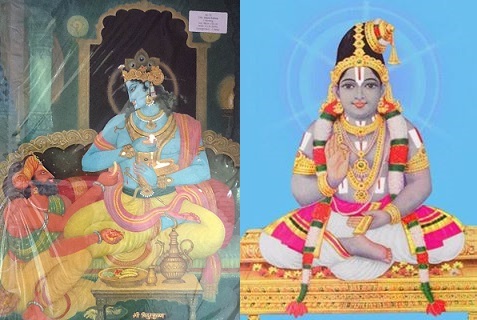 Now, if one thinks that the insignificant jIvAthmA with his inferior tools cannot worship sarvEsvaran (supreme lord) matching his greatness – that is not true – though bhagavAn due to him being the master of srI mahAlakshmi, has no unfulfilled desires and does not become any more complete by the offerings given by the samsAri jIvAthmA who is bound in this material world) – how can one worship him? When the jIvAthmA performs a small kainkaryam to fulfill his own nature of servitude, bhagavAn considers that itself as a great favour; Since bhagavAn already has everything and does not need to be satisfied any further by the jIvAthmA‘s offerings, since he is waiting to acknowledge the jIvAthmA irrespective of whatever is offered by him, since he is ready to freely interact with the jIvAthmA due to him being the master of srI mahAlakshmi, approaching bhagavAn is a lot easier unlike approaching other dhEvathAs;. As one engages in bhagavath vishayam, all the obstacles will be removed. Approaching emperumAn would also be enjoyable; jIvAthmA need not seek out for additional materials to satisfy emperumAn; Since its relating to approaching bhagavAn, there is no question of prathyavAya (limitations/mistakes); there is no restriction based on materials, time and the qualification of the worshiper; Thus AzhwAr says bhagavAn is easily worshippable. thadhaiva – at once – unlike those karmas which produce result at a different time, place, etc. asnAmi – he accepts them as if they are the ones he is greatly longing for; it is also explained as – just like the devotee submits them while trembling with great love, emperumAn too accepts them while trembling with great love. mahAbhAratham udhyOga parvam 87.13 “anyath pUrNAdhapAm kumbhAdhithyAdhi” (bhagavAn vishNu does not expect anything more than a pot of water for washing hands/feet and a kind enquiry). svayam – himself. Though one may be very rich, one will not appoint some one to fan/wipe the sweat of his wife. Similarly, emperumAn will accept everything personally from his devotees. In this way, AzhwAr establishes that it is very easy to worship emperumAn. Each pAsuram is discussed subsequently. This entry was posted in thiruvAimozhi, thiruvAimozhi 1st centum on August 20, 2015 by Sarathy Thothathri.